There is a widespread misconception that Malta before the Knights was a cultural desert. This was not the case. It has been one of the major concerns of my long academic career to prove it wrong. Research undertaken by my students have fine-tuned the evidence for a culturally informed Late Medieval Malta. It is now obvious that the Civitas, or Notabile, which we habitually call by its Islamic name Mdina, stood comparison, socially and culturally, with the city communes of the Kingdom of Sicily that included the Calabria and Salento regions of South Italy. Like them it had a culturally refined gentry, an administratively competent ‘Universitas’ (Town Council) and a politically powerful Cathedral Chapter. In spite of differences over rights and jurisdictions, the ‘Universitas’ and the Chapter distinguished themselves as informed patrons of the arts and made significant gifts to the Cathedral, which by mutual consent, was the city’s most important building and symbol of its prestige. One needs only mention the great retable of St. Paul, which the ‘Universtas’ commissioned, in the early fifteenth century, from the workshop of Lluis Borassa, the most significant Late Gothic artist of Catalonia/Aragon. Paintings and other objets d’art were commissioned not only from the Kingdom of Sicily, of which Malta was a political appendage, but also from the more distant Venice, with which the island had good contacts, and from Catalonia/Aragon. The Mendicant friars, the Augustinians, the Franciscan Observants and Conventuals, the Carmelites and lastly the Dominicans, who started establishing houses in the late fifteenth century, were an added source of cultural enrichment and, to an extent, responsible for the introduction of a Renaissance sensibility which gave to the island the now academically accepted art historical significance of the southernmost outpost of the Quattrocento Renaissance. This introduction was essential to an art historical appreciation, in a meaningful context of the Old Cathedral choir. The interest in the story of the choir is heightened by the fact that the three most important political and religious forces conditioning life in fifteenth century Malta, the ‘Universitas’, the Cathedral Chapter, and the Mendicant Friars (in this case the Dominicans) were, in the 1480s, the major protagonists who acted and interacted with conflicting interests, and mutual mistrust and antagonism in its acquisition and installation. The Cathedral was, as I have already hinted, the pivotal focus of the interest of the ‘Universitas’ and the Chapter who, in different ways, valued it as a symbol of their importance and political clout. To the Chapter it was the seat of its ecclesiastical authority and socio-political significance. It was, as a result, justifiably aggrieved at the fact that the privilege of choosing the procurators with a preeminent right for its maintenance and architectural modifications was not vested in it but, by Royal charter, vested in the ‘Universitas’. This led to disagreements that were several times bitter. Art and politics are closely related and the choir stalls are an interesting case study. The Mendicant Dominicans, who had only a short-time previously established a house in Malta, had meanwhile developed an interest in the Cathedral which they exploited by astutely broaching a skillful agreement between the Chapter and the ‘Universitas’. By the 1480s, the Cathedral had been transformed into a discreetly dignified and ornate building, but the ‘Universitas’ was unhappy with the choir and directed its procurators to commission a new more artistically prestigious set of stalls that would complement the resplendent retable of St. Paul which it had earlier donated to the church. The Bishop, Antonio d’Alagona, who questioned the jurisdiction rights of the ‘Universtas’ procurators, objected and through his vicar-general, Don Michele Falsone (he himself resided in Sicily), brushing aside the fact the choir was a donation, proclaimed his right to decide on the matter. To further emphasize his authority he refused to permit the ‘Universitas’ to fill the vacancy for a new procurator threatening its aldermen (the ‘giurati’) with excommunication if it proceeded with an appointment. It was at this stage that the friar Pietro Zurchi, Prior of the Dominican House, probably in connivance with the ‘Universitas’, stepped in with an offer to mediate. 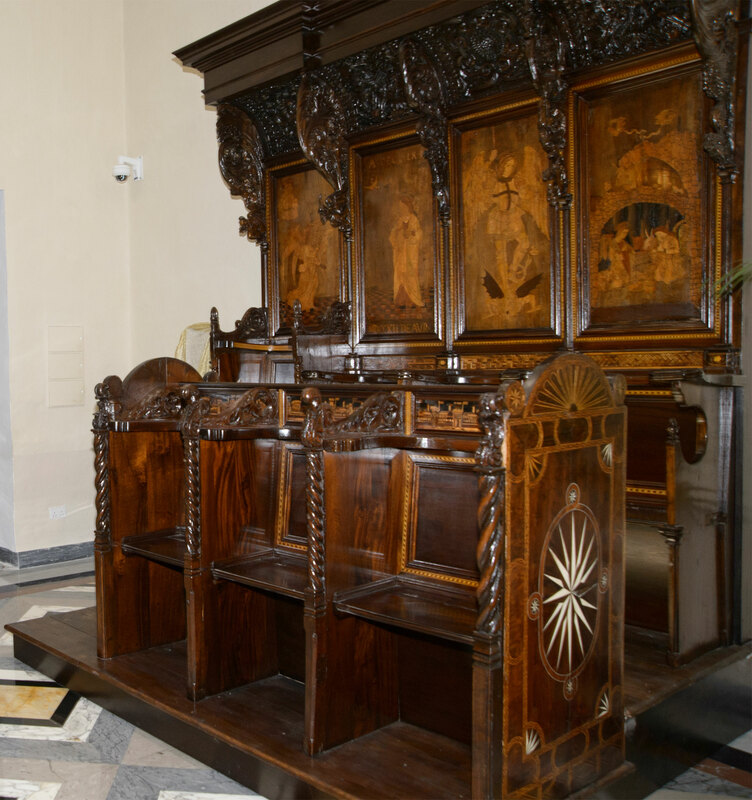 With apparent generosity, he offered the Chapter to exchange its old choir with a new set of stalls that he had commissioned in Catania for the Dominican church which he was at the time constructing. This suggests that the old choirt was still serviceable and in good state. Zurchi had a political agenda. He aspired to the appointment of ‘Cappellano maggiore’ of the Cathedral but the office was contested by a nominee of the Bishop to whom the ‘Universitas’ objected because he was too young and was ignorant of the Maltese language. With the support of the Dominican Vicar-General in the Kingdom of Sicily, who enjoyed the favour of the Royal curia, Zurchi, got his appointment and in fulfillment of his promise to the Chapter, and to the satisfaction of the ‘Universitas’ which had supported his claim, he donated his new choir to the Cathedral. It was a victory for the ‘Universitas’, but the Cathedral was artistically enriched. The affair was a skilfully crafted exercise of politico-religious intrigue. Fra Pietro Zurchi (1462-1505) was a powerful personality and, in many ways, a remarkable man. Resourceful and politically astute, he was, in addition, artistically well informed and had useful contacts with the most important artists active in Sicily from whom he commissioned works for the Dominican church which he himself designed, inscribing his name in Gothic characters above the main door. The works he donated to his church, included a white marble tabernacle-reliquary, now on the altar of the vestry of the rebuilt church, which is one of the most eloquent examples of Early Renaissance art in Malta. It has the stylistic and artistic idiosyncrasies of a Domenico Gagini although there has been a recent attribution to Francesco Laurana who was active in Sicily after completing his work on the great triumphal arch of Alfonso V in Naples, where he worked alongside Domenico Gagini. The Cathedral choir was commissioned by Zurchi at around the same time, as the tabernacle-reliquary, from the Catania master carpenterji (‘maitres ebenist’), the brothers Parisio and Pierantonio Calacura. The Calacura brothers are unfortunately insufficient studied and we have no biographical knowledge of them. Zurchi had seen the choir they had produced for the church of San Domenico, in Syracuse and was impressed. He, as a matter of fact, instructed the carpenterji to use the same style and technique for his choir. The contract of works was drawn up in Syracuse on 2 January 1482 and registered in the acts of Notary Giovanni Antonio Candachia. The Calacura carpenterji agreed to the payment of 40 ‘uncie’ and bound themselves to complete the choir within two years. This was an obligation which they did not honour for, perhaps on account of the complexities of the work, the choir was not finished before 1487. The choir in walnut, chestnut and pine wood is made up of twenty stalls. 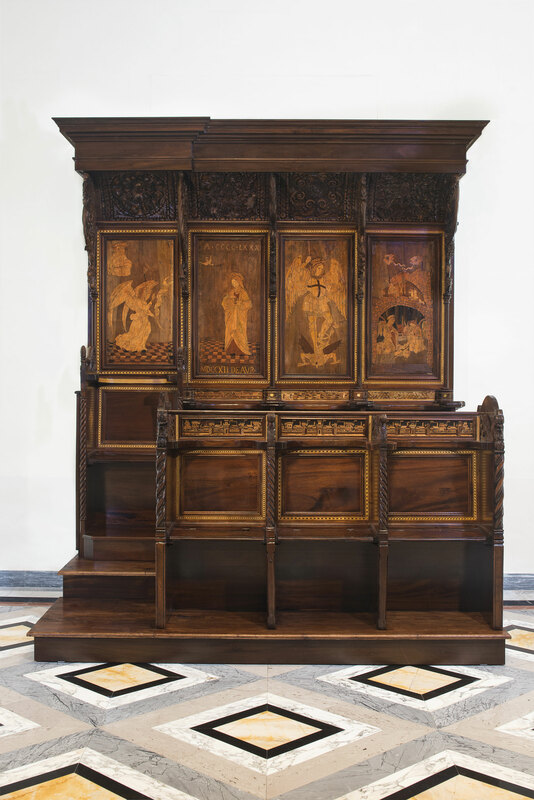 It is a work of remarkable quality but what makes it especially notable are the wood inlays of saints, Biblical stories and allegorical personifications which luxuriate in a wealth of imagery and linear subtleties. In broad terms, the inlays speak a Late Gothic language with incipient Renaissance interpolations. Sienese influence, which was a conditioning factor of Sicilian fifteenth century art, predominates but is not exclusive. There are also hints of Flemish and Provençal influences, presumably betraying an acquaintance with the paintings of the Angevin Royal household in Naples to which Sicilian artists gained access after the Aragonese conquest of the city, in 1442. Parisio and Pierantonio Calacura produced their inlays from drawings by artists of unequal ability. This accounts for the fact that their artistic interest fluctuates. The visually and artistically superb inlays of The First Christmas, The Fall of Adam and Eve, The Annunciation of the Virgin (in two panels) and the St Michael betray a gifted and well-informed artist. The Calacura carpenterji obviously had good artistic contacts which they judiciously exploited in their wood inlays. They were also gifted wood-carvers. One must also mention the inlaid fictive claustrophobically cluttered inlaid townscape frieze. The style is hackneyed and anachronistic and my guess is that the frieze reproduces a prototype common in the decoration of South Italian and Sicilian Gothic choirs. Whichever the case the frieze merits a proper study and investigation. Until this is done one can only talk of it in conjectural terms. The choir was an enriching addition to the Cathedral. It remained in use until 1876 when it was replaced by the present choir with wood inlays by Emmanuel Decelis to drawings based on works by Freidrich Overbeck. In its lengthy life- span, the Fratellli Calacura choir was subjected to unhappy restorations and accretions. In 1681, six new stalls were added bringing the number to twenty-six but two of the new stalls were removed in 1712 when the number was stabilized at twenty-four. It survived with, apparently minor damage, the earthquake of 1693 and was subsequently installed in the new Baroque Cathedral. The beauty and lyrical appeal of the wood inlays was not lost to the discerning visitor, such as Sarah Austin, wife of John Austin, Royal Commissioner to Malta in 1836-37. Ms Austin commissioned drawings of the inlays from Giuseppe Hyzler and persevered in having two of them reproduced in vol. 1 of A.B. Janson’s classic book ‘Sacred and Legendary Art’ published in 1848. To conclude. The Late Gothic significance of the Fratelli Calachura choir is just one example, of the habitually ignored, cultured refinement and informed artistic patronage of pre-Knights Malta, that I emphasized in my introduction. Art historical study and the archival findings of committed researchers have put the record straight but the misconception of a backwardly provincial Late Medieval Malta unfortunately still enjoys popular currency. The Cathedral Chapter. and the Cathedral Museum in particular, have been essential contributory agents in rectifying this erroneous concept. The restoration of the choir is their latest outstanding achievement.